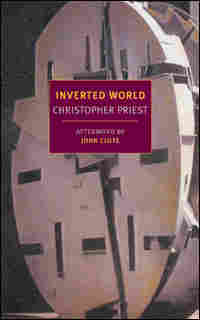 An Intensely Imagined Future In 'Inverted World' Recently reissued, Christopher Priest's 1974 sci-fi classic, Inverted World, tells the story of a city built on rails and in perpetual motion. Jessa Crispin adds up the pieces of Priest's "tightly structured puzzle" and discovers a novel that stands up to the test of time. It's standard for book lovers and English majors to sneer at advanced math classes in college. "Do we really have to take this? It's not like we'll ever use it." But we were all wrong. Calculus does come in handy, at least when you're reading Christopher Priest. Priest is probably best known for his prize-winning 1995 novel The Prestige, later adapted into a hit Christopher Nolan film. 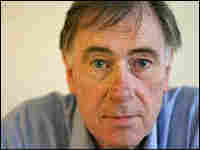 But in science-fiction circles, he's known as one of the best living British writers. 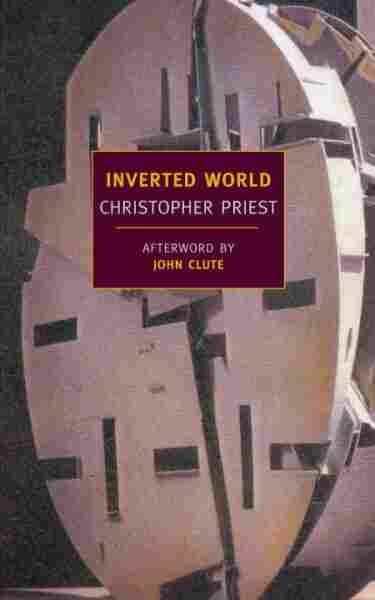 NYRB Classics recently reissued Priest's 1974 novel, Inverted World, and while much of SF from that era is outrageously outdated (cough Heinlein cough), Priest's work has not aged a bit. Helward Mann is "six hundred and fifty miles" old. His city is built on rails, constantly moving north to stay within range of "the optimum." His job is not only to maintain the city's motion but also to protect the secret of what lies outside the optimum. The inhabitants of the city seem to be earthlings trapped on another planet, but if that's so, why do the hostile villagers speak Spanish? And why is the sun described as "a broad orange disk, slightly tilted down towards us. Above and below, tall spires of light rose from the center of the disk"? Those of you who managed to get beyond advanced algebra might have already figured out what's to come. Not that the book is just for math geeks. Priest's intense depiction of a man's loyalty being torn between his truth-seeking, rabble-rousing wife and what his leaders tell him is best for the city makes this a blistering read, and the theme of governmental secrecy and exploitation of the natives still remains topical. Inverted World is a tightly structured puzzle with an ending that, while shocking, makes perfect, mathematical sense. Priest is not hiding in the corners of the book, snickering because he fooled you. He's probably just happy you were so involved in the reading, even if you had to look up the word "hyperbola." I HAD REACHED the age of six hundred and fifty miles. Beyond the door the guildsmen were assembling for the ceremony in which I would be admitted as a guild apprentice. It was a moment of excitement and apprehension, a concentration into a few minutes of all that my life had been until then. My father was a guildsman, and I had always seen his life from a certain remove. I regarded it as an enthralling existence, charged with purpose, ceremony, and responsibility; he told me nothing of his life or work, but his uniform, his vague manner, and his frequent absences from the city hinted at a preoccupation with matters of utmost importance. Within a few minutes the way would be open for me to join that life. It was an honour and a donning of responsibility, and no boy who had grown up inside the confining walls of the creche could fail to respond to the thrill of this major step. The creche itself was a small building at the very south of the city, except by way of a door which was normally locked, and the only opportunities for exercise existed in the small gymnasium and a tiny open space, bounded on all four sides by the high walls of the creche buildings. Like the other children I had been placed in the charge of the creche administrators soon after my birth, and knew no other world. I had no memories of my mother: she had left the city soon after my birth. It had been a dull but not unhappy experience. I had made some good friends, and one of them — a boy a few miles older than me called Gelman Jase — had become an apprentice guildsman a short time before me. I was looking forward to seeing Jase again. I had seen him once since his coming of age, when he returned briefly to the creche, and already he had adopted the slightly preoccupied manner of the guildsmen, and I had learned nothing from him. Now that I too was about to become an apprentice I felt that he would have much to tell me. The administrator returned to the ante-room in which I was standing. "They're ready," he said. "Can you remember what you have to do?" I discovered that I was trembling, and the palms of my hands were moist. The administrator, who had brought me from the creche that morning, grinned at me in sympathy. He thought he understood the ordeal I was suffering, but he knew, literally, only half of it. After the guild ceremony there was more in store for me. My father had told me that he had arranged a marriage for me. I had taken the news calmly because I knew that guildsmen were expected to marry early, and I already knew the chosen girl. She was Victoria Lerouex, and she and I had grown up together in the creche. I had not had much to do with her — there were not many girls in the creche, and they tended to keep together in a tight-knit group — but we were less than strangers. Even so, the notion of being married was a new one and I had not had much time to prepare myself mentally for it. The administrator glanced up at the clock. We shook hands briefly, and he opened the door. He walked into the hall, leaving the door open. Through it I could see several of the guildsmen standing on the main floor. The ceiling lights were on. The administrator stopped just beyond the door and turned to address the platform. "My Lord Navigator. I seek audience." "Identify yourself." A distant voice, and from where I was standing in the ante-room I could not see the speaker. "I am Domestic Administrator Bruch. At the command of my chief administrator I have summoned one Helward Mann, who seeks apprenticeship in a guild of the first order." "I recognize you, Bruch. You may admit the apprentice." Bruch turned and faced me, and as he had earlier rehearsed me I stepped forward into the hall. In the centre of the floor a small podium had been placed, and I walked over and took up position behind it. Here in the concentrated brilliance of the spotlights sat an elderly man in a high-backed chair. He was wearing a black cloak decorated with a circle of white stitched on the breast. On each side of him stood three men, all wearing cloaks, but each one of these was decorated with a sash of a different colour. Gathered on the main floor of the hall, in front of the platform, were several other men and a few women. My father was among them. Everyone was looking at me, and I felt my nervousness increase. My mind went blank, and all Bruch's careful rehearsals were forgotten. In the silence that followed my entrance, I stared straight ahead at the man sitting at the centre of the platform. This was the first time I had even seen — let alone been in the company of — a Navigator. In my immediate background of the creche such men had sometimes been spoken of in a deferential way, sometimes — by the more disrespectful — in a derisory way, but always with undertones of awe for the almost legendary figures. That one was here at all only underlined the importance of this ceremony. My immediate thought was what a story this would be to tell the others ... and then I remembered that from this day nothing would be the same again. Bruch had stepped forward to face me. "Are you Helward Mann, sir?" "What age have you attained, sir?" "Six hundred and fifty miles." "Are you aware of the significance of this age?" "I assume the responsibilities of an adult." "How best can you assume those responsibilities, sir?" "I wish to enter apprenticeship with a first-order guild of my choice." "Have you made that choice, sir?" Bruch turned and addressed the platform. He repeated the content of my answers to the men assembled there, though it seemed to me that they must have been able to hear my answers as I gave them. "Does anyone wish to question the apprentice?" said the Navigator to the other men on the platform. "Very well." The Navigator stood up. "Come forward, Helward Mann, and stand where I can see you." Bruch stepped to one side. I left the podium, and walked forward to where a small white plastic circle had been inlaid into the carpet. I stopped with my feet in the centre of it. For several seconds I was regarded in silence. The Navigator turned to one of the men at his side. "Do we have the proposers here?" "Very well. As this is a guild matter we must exclude all others." The Navigator sat down, and the man immediately to his right stepped forward. "Is there any man here who does not rank with the first order? If so, he will grace us with his absence." Slightly behind me, and to one side of me, I noticed Bruch make a slight bow towards the platform, and then he left the hall. He was not alone. Of the group of people on the main floor of the hall, about half left the room by one or other of the exits. Those left turned to face me. "Do we recognize strangers?" said the man on the platform. There was silence. "Apprentice Helward Mann, you are now in the exclusive company of first-order guildsmen. A gathering such as this is not common in the city, and you should treat it with appropriate solemnity. It is in your honour. When you have passed through your apprenticeship these people will be your peers, and you will be bound, just as they are, by guild rules. Is that understood?" it for all to hear." "I wish to become a Future Surveyor," I said. of this part of the ceremony, only that I should display appropriate respect towards the Navigator when formally introduced to him. "Do we have a proposer for the apprentice?" "Sir, I wish to propose him." It was my father who spoke. "Future Surveyor Mann has proposed. Do we have a seconder?" "Sir, I will second the proposal." "Bridge-Builder Lerouex has seconded. Do we hear any dissent?" There was a long silence. Twice more, Clausewitz called for dissent, but no one raised any objection to me. I now offer you the oath of a first-order guild. You may — even at this late stage — decline to take it. If, however, you do swear to the oath you will be bound to it for the whole of the rest of your life in the city. The penalty for breaching the oath is summary execution. Is that absolutely clear in your mind?" Jase, or even Bruch, had said anything to warn me of this. Perhaps Bruch had not known ... but surely my father would have told me? "Do I have to decide now, sir?" It was quite clear that I would not be allowed a sight of the oath before deciding. Its content was probably instrumental in the secrecy. I felt that I had very little alternative. I had come this far, and already I could feel the pressures of the system about me. To proceed as far as this — proposal and acceptance — and then to decline the oath was impossible, or so it seemed to me at that moment. "I will take the oath, sir." Clausewitz stepped down from the platform, walked over to me, and handed me a piece of white card. "Read this through, clearly and loudly," he told me. "You may read it through to yourself before, if you wish, but if you do so you will be immediately bound by it." I nodded to show my understanding of this, and he returned to the stage. The Navigator stood up. I read the oath silently, familiarizing myself with its phrases. I faced the platform, aware of the attention of the others on me, not least that of my father. "That on acceptance as a full guildsman I shall apprise myself of the contents of the document known as Destaine's Directive, and that I shall make it my duty to obey its instructions, and that further I shall pass on the knowledge obtained from it to future generations of guildsmen. "That the swearing of this oath shall be considered a matter of guild security. "All this is sworn in the full knowledge that a betrayal of any one of these conditions shall lead to my summary death at the hands of my fellow guildsmen." I looked up at Clausewitz as I finished speaking. The very act of reading those words had filled me with an excitement I could hardly contain. "Beyond the city..." That meant I would leave the city, venture as an apprentice into the very regions which had been forbidden me, and were even yet forbidden to most of those in the city. The creche was full of rumours about what lay outside the city, and already I had any number of wild imaginings about it. I was sensible enough to realize that the reality could never equal those rumours for inventiveness, but even so the prospect was one that dazzled and appalled me. The cloak of secrecy that the guildsmen placed around it seemed to imply that something dreadful was beyond the walls of the city; so dreadful that a penalty of death was the price paid for revealing its nature. Clausewitz said: "Step up to the platform, Apprentice Mann." I walked forward, climbing the four steps that led up to the stage. Clausewitz greeted me, shaking me by the hand, and taking away from me the card with the oath. I was introduced first to the Navigator, who spoke a few amiable words to me, and then to the other chief guildsmen. Clausewitz told me not only their names but also their titles, some of which were new to me. I was beginning to feel overwhelmed with new information, that I was learning in a few moments as much as I had learned inside the creche in all my life to that date. There were six first-order guilds. In addition to Clausewitz's Future Surveyors guild, there was a guild responsible for Traction, another for Track-Laying and another for Bridge-Building. I was told that these were the guilds primarily responsible for the administration of the city's continued existence. In support of these were two further guilds: Militia and Barter. All this was new to me, but now I recalled that my father had sometimes referred in passing to men who bore as titles the names of their guilds. I had heard of the Bridge-Builders, for instance, but until this ceremony I had had no conception that the building of a bridge was an event surrounded by an aura of ritual and secrecy. How was a bridge fundamental to the city's survival? Why was a militia necessary? Indeed, what was the future? I was taken by Clausewitz to meet the Future guildsmen, among them of course my father. There were only three present; the rest, I was told, were away from the city. With these introductions finished I spoke to the other guildsmen, there being at least one representative from each of the first-order guilds. I was gaining the impression that the work of a guildsman outside the city was a major occupier of time and resources, for on several occasions one or other of the guildsmen would apologize for there being no more of their number at the ceremony, but that they were away from the city. During these conversations one unusual fact struck me. It was something that I had noticed earlier, but had not registered consciously. This was that my father and the other Future guildsmen appeared to be older than the others. Clausewitz himself was strongly built, and he stood magnificently in his cloak, but the thinness of his hair and his lined face betrayed his age; I estimated him to be at least two thousand five hundred miles old. My father too, now I could see him in the company of his contemporaries, seemed remarkably old. He was of an age similar to Clausewitz, and yet logic denied this. It would mean that my father would have been about one thousand eight hundred miles at the time I was born and I already knew that it was the custom in the city to produce children as soon after reaching maturity as possible. The other guildsmen were younger. Some were evidently only a few miles older than myself; a fact which gave me some encouragement as now I had entered the adult world I wished to be finished with the apprenticeship at the earliest opportunity. The implication was that the apprenticeship had no fixed term, and if, as Bruch had said, status in the city was as a result of ability, then with application I could become a full guildsman within a relatively short period of time. There was one person missing, whom I would have liked to be there. That was Jase. Speaking to one of the Traction guildsmen, I asked after him. "Gelman Jase?" he said. "I think he's away from the city." "Couldn't he have come back for this?" I said. "We shared acabin in the creche." "Jase will be away for many miles to come." The guildsman only smiled at this, infuriating me . . . for surely, now I had taken the oath I could be told? Later, I noticed that no other apprentices were present. Were they all away from the city? If so, that probably meant that very soon I too could leave. After a few minutes talking to the guildsmen, Clausewitz called for attention. "I propose to recall the administrators," he said. "Are there any objections?" There was a sound of general approval from the guildsmen. "In which case," Clausewitz continued, "I would remind the apprentice that this is the first occasion of many on which he is bound by his oath." Clausewitz moved down from the platform, and two or three of the guildsmen opened the doors of the hall. Slowly, the other people returned to the ceremony. Now the atmosphere lightened. As the hall filled up I heard laughter, and in the background I noticed that a long table was being set up. There seemed to be no rancour from the administrators about their exclusion from the ceremony that had just taken place. I assumed that it was a common enough event for it to be taken as a matter of course, but it crossed my mind to wonder how much they were able to surmise. When secrecy takes place in the open, as it were, it lays itself open to speculation. Surely no security could be so tight that merely dismissing them from a room while an oath-taking ceremony took place would keep them in the dark as to what was happening? As far as I could tell, there had been no guards at the door; what was there to prevent someone eavesdropping while I spoke the oath? I had little time to consider this for the room was filled with activity. People spoke together in an animated way, and there was much noise as the long table was laid with large plates of food and many different kinds of drink. I was led from one group of people to another by my father, and I was introduced to so many people that I was soon unable to remember names or titles. "Shouldn't you introduce me to Victoria's parents?" I said, seeing Bridge-Builder Lerouex standing to one side with a woman administrator who I assumed was his wife. "No . . . that comes later." He led me on, and soon I was shaking hands with yet another group of people. I was wondering where Victoria was, for surely now that the guild ceremony was out of the way our engagement should be announced. By now I was looking forward to seeing her. This was partly due to curiosity, but also because she was someone I already knew. I felt outnumbered by people both older and more experienced than me, and Victoria was a contemporary. She too was of the creche, she had known the same people as me, was of a similar age. In this room full of guildsmen she would have been a welcome reminder of what was now behind me. I had taken the major step into adulthood, and that was enough for one day. Time passed. I had not eaten since Bruch had woken me, and the sight of the food reminded me of how hungry I was. My attention was drifting away from this more social aspect of the ceremony. It was all too much at once. For another half an hour I followed my father around, talking without much interest to the people to whom I was introduced, but what I should really have welcomed at that moment was some time left to myself, so that I could think over all that I had learned. Eventually, my father left me talking to a group of people from the synthetics administration (the group which, I learned, was responsible for the production of all the various synthetic foods and organic materials used in the city) and moved over to where Lerouex was standing. I saw them speak together briefly, and Lerouex nodded. In a moment my father returned, and took me to one side. "Wait here, Helward," he said. "I'm going to announce your engagement. When Victoria comes into the room, come over to me." He hurried away and spoke to Clausewitz. The Navigator returned to his seat on the platform. "Guildsmen and administrators!" Clausewitz called over the noise of the conversations. "We have a further celebration to announce. The new apprentice is to be engaged to the daughter of Bridge-Builder Lerouex. Future Surveyor Mann, would you care to speak?" My father walked to the front of the hall and stood before the platform. Speaking too quickly, he made a short speech about me. On top of everything else that had happened that morning this came as a new embarrassment. Uneasy together, my father and I had never been so close as he made out by his words. I wanted to stop him, wanted to leave the room until he had finished, but it was clear I was still the centre of interest. I wondered if the guildsmen had any idea how they were alienating me from their sense of ceremony and occasion. To my relief, my father finished but stayed in front of the platform. From another part of the hall Lerouex said that he wished to present his daughter. A door opened and Victoria came in, led by her mother. As my father had instructed I walked over and joined him. He shook me by the hand. Lerouex kissed Victoria. My father kissed her, and presented her with a finger-ring. Another speech was made. Eventually, I was introduced to her. We had no chance to speak together.